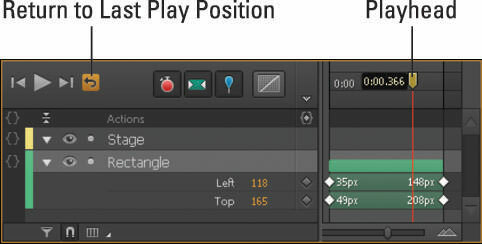 By turning Auto-Transition mode on or off in Adobe Edge Animate, you toggle the capability to create smooth transitions between keyframes. Transitions are the animations that you create to show (for example) an element moving from left to right on the Stage (transitions are also referred to as animation sequences). When you create a new file, the Auto-Transition mode is enabled for you (as shown in this figure). You’ll also see a colored arrow between the Pin and the Playhead. Here the default state for Auto-Transition mode is enabled. When Auto-Transition mode is turned on, Edge Animate creates an animation effect when you move elements around the Stage, provided you’ve toggled the Pin and Playhead as outlined in the next few sections. You’ll know when you’ve created an animation: The color-coded bars appear between the keyframes, as shown in this figure. If you click the Auto-Transition icon, it dims, and Edge Animate will not create an animated sequence. Instead, Edge Animate only inserts the keyframe diamonds; you won’t see the colored bars (see this figure). When Auto-Transition is turned off, Edge Animate won’t create animations. If you want animation sequences to appear when you move elements around the Stage, make sure that the Stopwatch icon is red and the Auto-Transition mode is enabled. If you want to move elements around on the Stage without creating keyframes or animation sequences, then disable both the Stopwatch and the Auto-Transition icon. You also have to toggle the Pin, as discussed next.